Details of the long-secret Trans-Pacific Partnership are public at last: it will undermine the safety of our food supply, make medicine more expensive, and give power to the biotech monopoly. Action Alert! A few weeks ago, the full text of the Trans-Pacific Partnership (TPP) trade deal was finally released after many years of closed-door negotiations between officials from the US and eleven other countries, all of whom border the Pacific Ocean. Its provisions were apparently kept secret from all but the biotech and pharmaceutical industries. Leaked documents during the trade negotiations provided reason to be concerned about the final agreement. And now, a review of the deal’s twenty-nine chapters and five thousand pages proves these early concerns were completely justified. The final package now awaits a vote in Congress, which is likely to take place in Spring 2016. The TPP contains a number of provisions that threaten current food safety laws. Generally speaking, passage of the TPP would mean that any US food safety law concerning things like pesticides, food additives, or labeling that is more stringent than “international standards” may be considered an “illegal barrier” to trade, and subject to enforcement. We have learned to beware of such “international standards.” They are largely determined by global special interests. 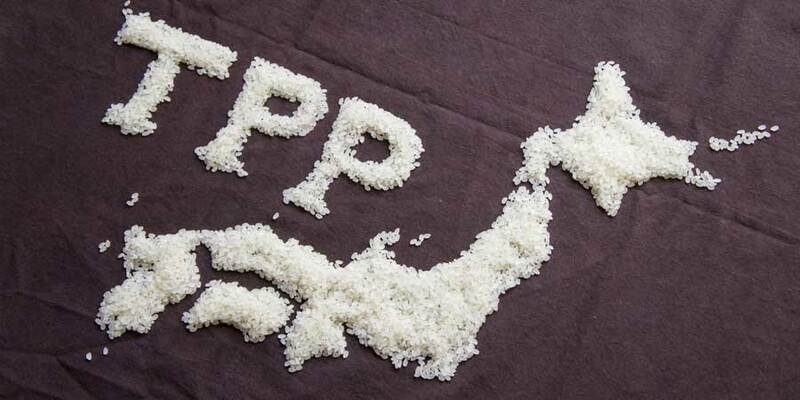 The TPP expands corporate power in other ways. The deal includes an investor-state dispute settlement (ISDS) system in which multinational corporations can challenge a host company’s regulations in an international court. ISDS has been a fixture in other trade treaties, including NAFTA (the North Atlantic Free Trade Agreement), and has been used to challenge countries’ economic policies, anti-smoking efforts, and environmental preservation laws. It is another giveaway to Big Food and other powerful multinational interests—a recurring theme throughout the TPP document. The trade agreement also undercuts US efforts to inspect food imports. The agreement limits food import inspections at the border “to what is reasonable and necessary,” and if an issue arises, a country must also provide an “opportunity for a review of the decision.” This provision, referred to as the Rapid Response Mechanism, may give exporting countries the right to challenge basic food safety provisions in the US. The TPP contains an entire chapter on intellectual property rights, with many provisions relating to pharmaceutical patents. No doubt heavily influenced by the pharmaceutical industry, the trade deal will force signatory countries to accept many of the same patent laws that have kept drug prices so astronomically high in the US. The deal would extend and broaden certain patent and data protections for the pharmaceutical industry, which Big Pharma can then use to keep prices high and delay competition from generics. It is a wonderful gift to the pharmaceutical industry—but a grave loss to patients in developing countries looking for access to affordable drugs. The TPP also allows a practice known as “evergreening,” which lets drug companies extend a patent on an old drug when it can be used to treat a new condition—another boon for Big Pharma’s monopoly power. Even when Big Pharma loses in the TPP, it wins. One of the more controversial topics in TPP negotiations concerned patent and data protections for biologic drugs—medicines derived not from inert chemical compounds but from living organisms. Big Pharma wanted twelve years of exclusivity— they already have this in the US—and US trade officials pushed hard in the negotiations to make this the standard. Instead, the deal grants them at least five years of exclusivity and as much as eight. Stops farmers from exchanging seeds—a common and important practice in many developing nations and indeed throughout human history. In countries that have not already turned agriculture over to the biotech industry, this could mean a substantial rewrite of regulations meant to protect farmers. Other treaties that signatory countries are compelled to join make it easier to apply for patents—making it very likely that more plants and seeds will be patented. We say: leave it. And if the US does reject it, do not worry about losing the reduction of tariffs that is already included. There will just be a second (and, we hope, a better) version to replace it. Action Alert! Write to your members of Congress and urge them to oppose the TPP deal, which undermines consumers and farmers and extends monopoly rights to major industries. Please send your message immediately. Healing a campus riven by student protests over race relations and recent online terror threats isn’t just a mandate for interim University of Missouri system president Mike Middleton. It’s also deeply embedded in his history. The former law professor, whose appointment was announced Thursday, spent 18 years as deputy chancellor on the same Columbia campus from which he graduated in 1971 and later received a law degree. The 68-year-old stepped down in August but continued to work part-time with now-ousted Chancellor R. Bowen Loftin on a plan to increase inclusion and diversity at the school. As an undergraduate, Middleton was a founder of the Legion of Black Collegians, an activist student group that participated in the protests that led to this week’s back-to-back resignations of former system President Tim Wolfe and Loftin. Protest leaders from the group Concerned Student 1950 — named for the year Missouri admitted its first back student — included some of the unmet demands Middleton helped create as a civil rights and anti-war protester. Middleton said he keeps a list of those original demands on his desk. His bona fides contributed to a warm welcome and vigorous applause from university administrators and leaders of two black student groups who attended Middleton’s news conference. A history of racially charged incidents dates back generations. Student protests culminate in departure of two University Officials. COLUMBIA, Mo. 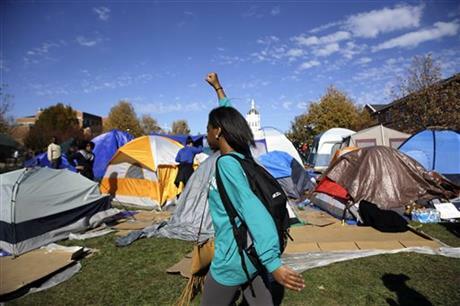 (AP) — This week’s events at the University of Missouri seemed to unfold rapidly, with little warning. But some students, faculty and alumni say the protests and sudden resignation of the president and chancellor are the culmination of years of racial tension on the state’s flagship campus. “Who built this university?” asked student government President Payton Head. “Who was building buildings in 1839” when the school was founded? Head’s social media accounts of having racial slurs shouted at him from a passing pickup truck helped spark a renewed protest movement at Missouri that culminated Monday with the resignation of university system President Tim Wolfe. Hours later, the top administrator of the Columbia campus, Chancellor R. Bowen Loftin, was forced out. AUG. 14: The university announces the elimination of subsidies that help pay health insurance costs for graduate students employed by the school. AUG. 26: Graduate students stage a walkout and rally, in part to oppose the health care cut. SEPT. 12: Missouri Student Association President Payton Head posts on Facebook that young people in a pickup truck yelled racial slurs at him. It’s the first of many racial incidents on the Columbia campus this fall. Sit-ins, walkouts and other protests follow, fueled by concern that administrators are not addressing the tension. SEPT. 16: The university and Planned Parenthood announce the end of their 26-year relationship after state lawmakers start investigating abortions performed at the university clinics. SEPT. 24: A “Racism Lives Here” rally takes place on campus. SEPT. 29: An estimated 1,000 protesters turn out for a rally in support of Planned Parenthood. OCT. 5: A drunk man yells racial slurs at members of the Legion of Black Collegians. Loftin, on Twitter and in a video message, expresses anger at the slurs. OCT. 6: Students and faculty stage a sit-in against racism and administrative inaction. OCT. 8: The university announces that freshmen will be required to undergo diversity training beginning in January, and the program will eventually be expanded to include all students, faculty and staff. As I sit in darkness writing this, I’m trying to keep my typing quiet, lest a real inhabitant of the neighborhood I’m parked in should walk by and wonder about the sounds coming from the rusty bus loitering on their block. Yes, you understood that correctly: Today, I work in a multi-million dollar office complex, and I live in a van. This summer, after receiving a job offer in Silicon Valley, I went on Craigslist and began sifting through housing listings: “verrrrrryyy cheap bedroom ;),” “great deal on rent!” A single room with a shared bathroom? Two thousand per month on the low-end. A small studio apartment, you ask? If your startup wasn’t recently bought for seven figures, forget about it. I perked up after finding a listing for $1,000 per month. Now this could work. Clicking through to the details section however revealed the offer was for a single bunk in a room with eight people, a set-up referred to as a “hacker house” by an (evil) marketing genius. Even if I was to spend the huge majority of my salary on rent, I knew I would likely still be in a grim living situation, resenting every penny I handed over that could have gone towards paying back my student loans. And as a software engineer, I’m one of the lucky ones! Imagine those who aren’t lucky enough to be on the tech payroll. Anyway, three weeks ago I took the equivalent of three months’ rent and bought an old red bus. It’s a 1969 VW camper van with a hole in the floor and a family of spiders that has more of a right to be here than I do (sleeping in your car on public land in California is illegal). But with the help of Ikea and an army of cleaning supplies I was able to get the bus into livable condition. At least 100 people have been arrested in Brussels, where hundreds more protested against TTIP, an impending free trade deal between the US and the EU, as the next round of TTIP talks approaches. Roads were paralyzed in the Belgian capital as a force of more than 600 activists descended on EU headquarters, blocking traffic and the venue of the EU leaders summit in protest against the Transatlantic Trade and Investment Partnership (TTIP). People carried signs and chanted slogans such as “Stop TTIP, stop austerity” and “Sorry for the inconvenience. We’re trying to save the world,” at the march in Brussels on Thursday. “TTIP is death” another sign read. One group of protesters displayed a balloon ‘Trojan Horse’ as an allegory for the deal. Peak Moment 87: In summer 2006 Judy Alexander embarked on an experiment to see how much food she could grow, and how many neighbors could benefit, from the garden around her house. Check out her homegrown rainwater collection and irrigation system – watering her 60+ edible crops. Meet the bees, the chickens and the worms. And catch her joy in producing so much food for so little effort. Anti-pipeline activist Allen Schreiber of Lincoln wears a shirt inscribed with slogans opposing the Keystone XL pipeline during a rally outside the State Capitol in Lincoln, Neb. TransCanada, the Calgary-based company behind the controversial Keystone XL pipeline, has backed out of a lawsuit filed by more than 100 Nebraska landowners, the company announced Tuesday. The energy company had been trying to gain access to private land along the proposed path of the tar sands pipeline, but had been held up legally by landowners who were opposed to letting the pipeline through their land. Now, instead of trying to gain access to that land through legal means, TransCanada will apply for a permit for Keystone XL with Nebraska’s Public Service Commission. TransCanada says the decision will bring more certainty to Keystone XL’s route through Nebraska. But it also could cause further delays for the project, as a PSC approval can take a year or longer. Previously, TransCanada sought to avoid the PSC approval process, choosing instead to give the state’s governor final approval over the project’s application in Nebraska. The law that gave the company the ability to choose was heavily challenged in court, but ultimately upheld. 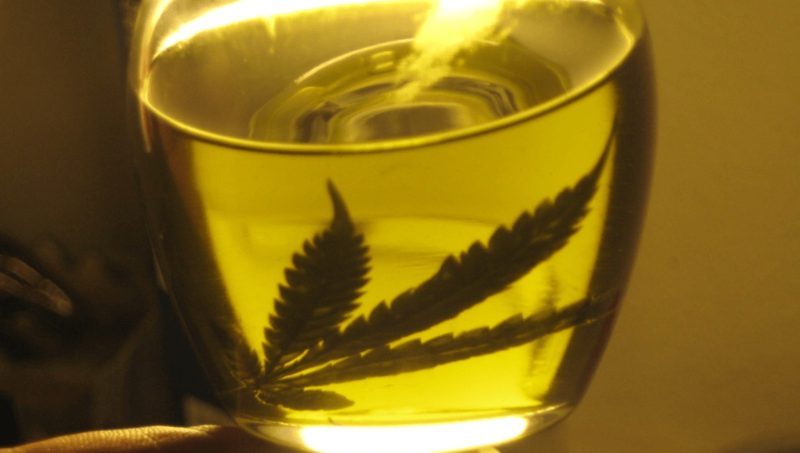 In a precedent-setting case, a state judge ruled this month that the mother of a New Jersey teenager with epilepsy, who is also her legal medical caregiver, cannot go to her school to administer her daughter’s cannabis oil. The oil treatments, which are legal in the state, control the young girl’s seizures and allow her to function normally in school, according to her parents. In its opinion, the court reasoned that state and federal laws prohibiting drug possession on school grounds takes precedence over the students’ right to use medical cannabis derivatives. This ruling is in spite of the fact that New Jersey has already legalized cannabis for medical use. This court setback is the third such defeat for the Barbour family, who have vowed to continue appealing. According to legal experts, this case is believed to be the first of its kind in the United States. Administrative Law Judge, John S. Kennedy ruled in January and again on appeal in August that the Larc School and the Maple Shade school district are stuck in a legal quandary. If allowed to administer the drug, the school nurse would be violating state laws, which ban the use of drugs in school zones and federal law that deems pot possession a crime. Roger and Lora Barbour have sued to require the nurse at their 16-year-old daughter’s special education school in Bellmawr administer cannabis oil, just like the nurse dispenses prescribed medication to other students. Since April, Genny has attended only half-days of school so she can be home for her lunchtime dose of homemade oil, diluted in a small glass of cola. In his 11-page ruling, the judge wrote that the family failed to show that their daughter would suffer “irreparable harm” if she were denied her medicine during the school day.